At the conclusion to Donkey Kong, Mario captured the great ape once again. Now Mario is carrying Donkey Kong to his hideout, and only Donkey Kong Jr. can rescue his Papa. 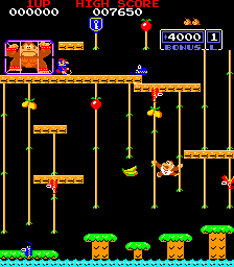 Donkey Kong Jr. features four stages set in the jungle and Mario's hideout. The hero must climb to the top of each stage to grab Mario's keys. Nitpickers, Snapjaws and Sparks stand in the way, so Junior must deftly climb the vines and chains to avoid them. In the final stage, Junior must use the keys to unlock Donkey Kong's cage. The son of Donkey Kong is a small gorilla with a "J" on his vest. He has to climb through Mario's traps to steal the keys to his Papa's cage. The giant gorilla has been captured by Mario, and is being carried to Mario's hideout. The hero of Donkey Kong has turned villain. Mario stands at the top of the screen and sends dangerous creatures after Junior. He holds the keys to Donkey Kong's cage. A metal crocodile with a chainlink tail. Red Snapjaws wander around and climb the vines and chains. Mario sends out blue Snapjaws with a crack of his whip, climbing down vines quickly before falling off the screen. A yellow and purple bird found on Stage 2. Mario sends them flying from the top of the screen, where they swoop down and drop eggs. A crow that lives in Mario's hideout on Stage 4. They appear from the top of the screen and swoop down to attack Junior from the side. Climb the chains carefully to avoid them. A red spark that appears on Stage 3. It moves around the electric platforms. Junior has to jump over them to avoid them. A blue spark on Stage 3 that Mario sends out with a flick of a switch. The blue spark follows a path down, crossing between platforms. The keys to Donkey Kong's cage. On Stages 1-3, Junior has to climb past Mario's traps and grab it to clear the stage. On Stage 4, the keys are suspended on chains and Junior has to push them into the locks to free Donkey Kong. Fruit that hangs from vines. If Junior hits the fruit it will fall down and destroy any enemies immediately below. Appearing on Stage 2, the Springboard is used to cross a difficult gap. If Junior times it right, he can use the Springboard a shortcut straight onto a higher platform.